Home > Business • Fun Stuff • Live Music & Entertainment > Win A Lake George Steamboat Beer And Wine Tasting Cruise With The Lake George Steamboat Company! Win A Lake George Steamboat Beer And Wine Tasting Cruise With The Lake George Steamboat Company! Win a Lake George Steamboat beer and wine tasting cruise! The Lake George Steamboat Company is having an amazing giveaway — the opportunity to go on a cruise for free! 3 lucky people win a pair of tickets each to cruise the lake on the Mohican while beer and wine tasting, with live music and even a complimentary souvenir glass! It’s true — you could win a fantastic cruise across beautiful Lake George for free! Invigorating, fantastic, but best of all, free! Your cruise will feature live music while you’re sampling all the beer they have on draft, right on the clear blue waters of the Queen of American Lakes. “How do I sign up?” you must be thinking. Simply fill out your name, email, and phone number, on the Steamboat Company beer and wine contest page and you’ll be in the running. While you’re at it, give Lake George and the Steamboat Company a “Like” on Facebook for all the fun you’ll be having on your cruise! Hurry up — the contest ends on August 12! The winner will be announced the next day, on Tuesday, the 13. Then, pick from your choice of cruises on Sunday, August 18 or Friday, September 13! A stunning $50 dollar value will be yours for free, with beer and wine included! Of course, no kids will be allowed to win a beer and wine tasting cruise. You must be 21 years old or older to be eligible. Each winner gets 2 tickets, so bring a friend or significant other. TIP: To boost your odds of winning, you can enter to win once every day! 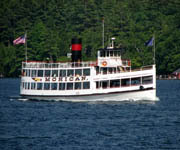 We all love the Lake George Steamboat Company, so why not celebrate your love for the lake and win a free cruise?! One of the area’s marvels is the Lake George Steamboat, so enter to win a night on the lake, with your favorite comforts and vices! Previous Article This Rain Does Have Benefits After All!